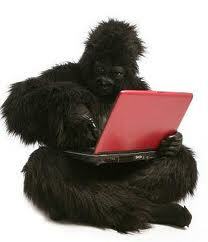 The only thing more dangerous than a monkey with a machine gun is a Gorilla in Charge with a lap top. You will be seeing quite a few changes and upgrades coming to the Silverback Nation and we will be announcing these in rapid succession Here come the first rounds down range. Issue #1 STREAMLINE THE CLASS: Our approach to CrossFit and our experienced committed coaching has proven a highly attractive combination. Silverbacks often find visiting athletes in our regular classes because we encourage them to come and try our methods among our greatest advertising; all of you. However as our popularity has grown this can sometimes slow the tempo of the class or take more time from the coaches than we intended. Solution: (Part 1) We will replace our offer of one free week. Instead, by appointment visitors to the Silverback Nation will attend regular workouts, guided though the class by their own dedicated coach. This guarantees the necessary attention to detail coaching for current and prospective athletes while visitors still get to soak in the great atmosphere you all bring to every workout. Solution: (Part 2) Our new “Fun de Mentals” is now two weeks (six sessions) We need new athletes to begin regular classes with a greater base of knowledge, experience and confidence. The classes are continuous so any new joins can begin on the next Monday. Our next “Fun de Mentals” class is Monday at 5:30 pm. THE WEEK AIN’T OVER YET!